We love these invitations that we printed for another designer for a wedding in Florida. They have just the right amount of formality and fun, with a unique color combination. The sea glass blue paper with gold ink is such an unexpected choice, but feels perfectly Miami. These letterpress invitations were printed for Tibi for a Spring 2016 runway show. Black and charcoal ink are modern and understated, just like their designs. It's fun to collaborate with creatives in another industry who share the same attention for detail. Sometimes we get asked to print really unique items that we never would have thought of ourselves. 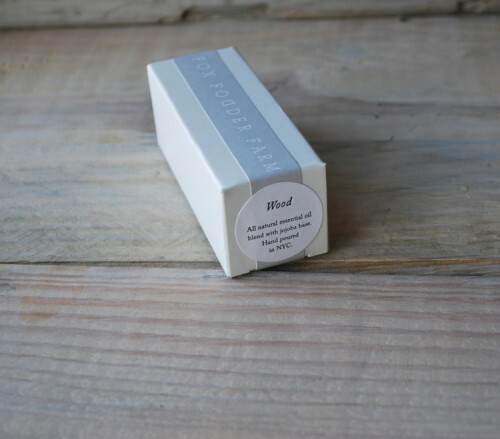 We worked with Jo Malone to print these wooden markers for an herb garden set, and they turned out really lovely! They potted Lemon Thyme, Parsley and Lavender and we printed the names in black ink with a logo on the reverse side. It can be a fun challenge to print on a new material, and it's especially rewarding when the project turns out well like this one. We printed these lovely wedding invitations for a designer client for their summer wedding. We love a combination of matte gold and rich black ink and it looks spectacular on this design. The art deco inspired details give these invitations a vintage feeling, and set the tone for a luxe event. We love when we have the opportunity to letterpress print wedding invitations for creative couples. These wedding invitations were designed by the betrothed couple, Jennifer and James. The result was a very unique design, full of color and fun flourishes. Jennifer and James fell in love with the South of France when they vacationed there together. From the delicious food to the warmth of the countryside, they knew that this was the perfect destination for their wedding. The event was held at an idyllic castle called Château de Lisse, no doubt the inspiration for many fairy tales. The week long event allowed their guests ample time to explore the South and the breathtaking grounds of the château. 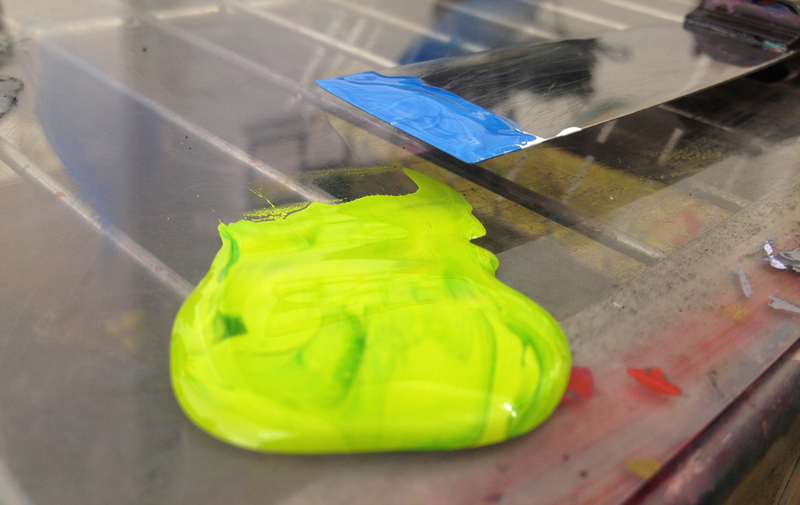 It was a lot of fun to print wedding invitations in such vibrant and playful colors. The bright green and blue ink look were an amazing combination. The background of the invitation was a half-tone moon printed in perfect sky blue, with stars dotting the edges. The decorative frame in vivid green added just the right amount of contrast. 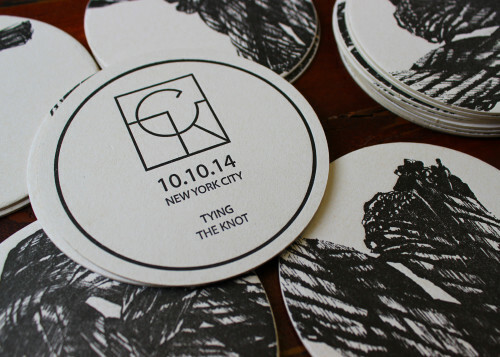 They designed these great matching coasters for the reception, as well. We love that they lined the border with the coordinates of the château and topped it off with a very stylish ampersand. 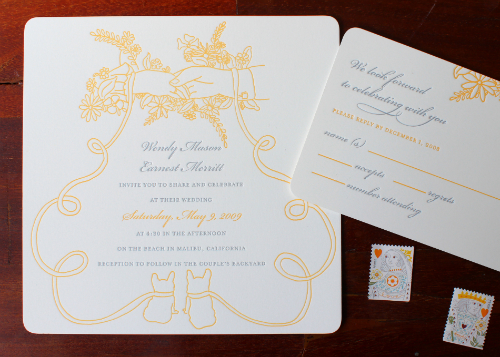 We are envious of anyone who received these letterpress wedding invitations! We're sure it was the trip of a lifetime. 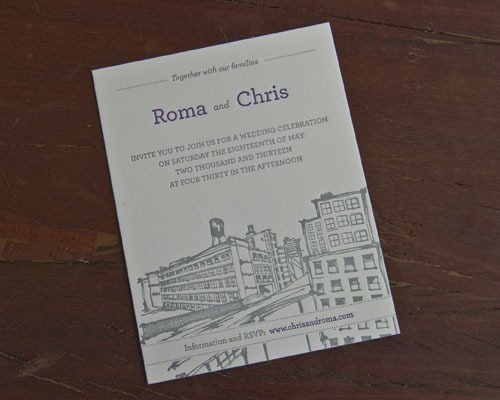 We always enjoy letterpress printing wedding invitations designed by our clients or their friends. We're constantly trying out new techniques and printing from other designers' artwork, gives us the opportunity to try something we may not have thought of. This sweet invitation set is a perfect example of that. It was designed by Leah Kim for Hyunbin Park and Lucas Soto. The design was perfect for letterpress and we were so happy to be able to work with this nice couple to print these. We could not wait to print these. It really is so inspiring to us to see the work of other designers and it constantly gives us new ideas for layouts and techniques. Alison Corrie and Morgan Sheasby collaborated on their wedding invitation design; what a lovely pre-wedding design task for these soon-to-be newlyweds! They chose one of our favorite color schemes: matte gold and black. They incorporated really lovely design elements; the subtle floral embellishments, the wine glass and sled and - our favorite of all - that awesome linked ampersand. The design features a blind-embossed background pattern overlaid with bold, chunky text in a gorgeous pale apricot color. We love how tactile this card is and how it plays with traditional notions of wedding invitations. The design is by the very talented Tim Geesman and his Thank You card layout is no less awesome. Again, the design is really clever: we love the subtle customization of the initials in the heart. Thanks Tim and Kate for working with us on your printing! Holstee is a lovely company that specializes in designing unique and beautiful products. 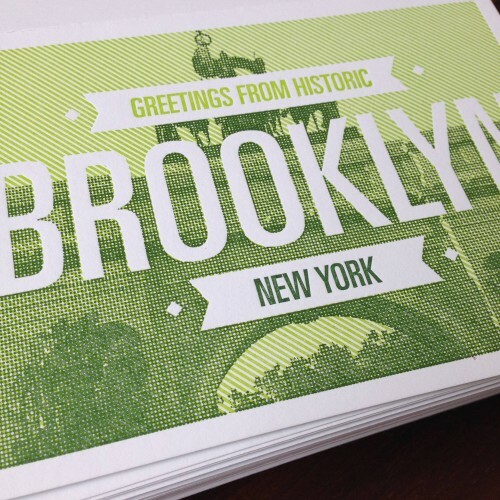 They contacted us with a series of graphic greeting cards, each of which feature an iconic Brooklyn landmark. So - with our love of this borough we call home - we were thrilled to work on printing these items. Can you recognize the three architectural designs? Don't you love those saturated colors. We always enjoy working with designers to render their ideas in letterpress: contact us if you have something you would like us to print for you! We worked with a really lovely couple on their Save the Date Cards. So when the time came for them to print their wedding invitations, we were excited to be involved again. Richie and Vilmarie are getting married in the Dominican Republic and Richie designed these gorgeous invitations, which feature a map of the island. We love how the design creates so many shades and hues, even though it is only printed in one color. The bride and groom actually stamped the little coral hearts onto the pieces, by hand, after they had been printed. We worked with a great designer (and soon-to-be-groom) to print his dream Save the Date coasters. These played on the idea of 'tying the knot' with a range of layouts of knotted rope. We've been looking through the Sesame Letterpress archives lately, searching for examples of pretty, whimsical hand drawn designs. We found a trio of gorgeous examples that we wanted to share on the blog today. We love how the colors of all three invitations create a perfect trio of Spring hues! We adore the wreath illustration and the interplay of handwritten text and printed text. Also, that aqua color is just so fresh and modern! This design just makes us smile: those two patient little pets at the bottom of the card! Any design - like this - with fine, line drawn detail prints perfectly in letterpress. What is so clever about this design is the way that the layout of the text mirrors the criss-cross of the branches in the illustration. This example also shows how sometimes a single color ink can add a really elegant cohesive feel to the design. Remember that we are always happy to incorporate your own hand drawn illustration into the design of your choice! 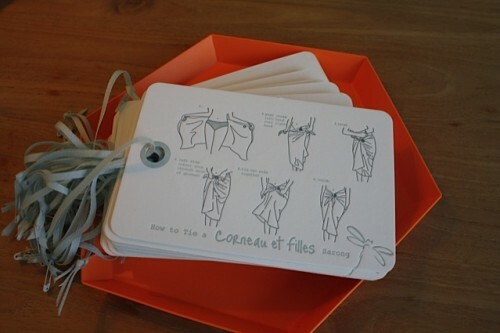 As soon as we heard from Helene at Corneau et Filles and looked through the beautiful sarongs on her website, we were excited to work on printing hangtags and other goodies for her shop. We love printing custom items for other small businesses: it's a pleasure to work with other creative people to design the perfect paper goods to complement their products! Here at Sesame, we love the traditional art of letter-writing and the luxury of fine stationery. With an affection for all things paper, it's hardly surprising that we are still massive fans of printed books. Even in the age of virtual books, we love turning actual pages! 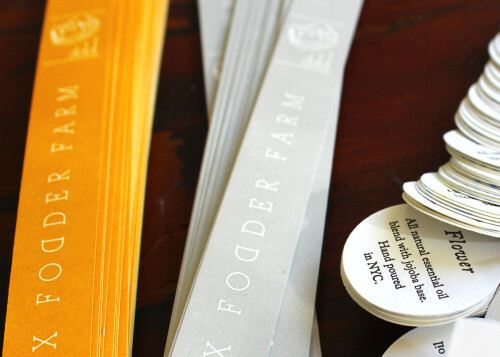 The bookmarks from our selection of products were designed specifically because we want to perpetuate the traditional notion of a book. 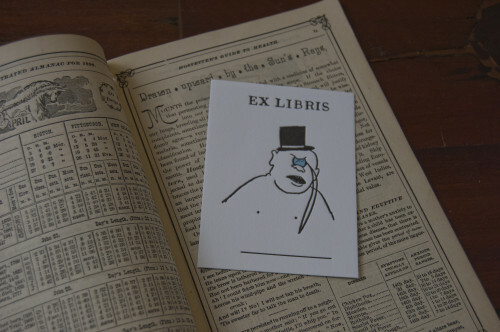 And we were delighted to be asked by our good friend, Matt Singer, to print a range of book plates that he designed. The color palette and handwritten font caught our attention and the whimsical illustrations made us smile. We now want to stick these into all of the books on our shelves! We were asked to print business cards for Chalk 242. They are a branding, design and marketing agency based in New York and we loved the look of their own branding. It was a very satisfying challenge for us to replicate the weathered look of the dark blue on their business card. We had to ensure that the plate allowed for subtly different ink coverage in different parts. We printed this text-based invitation for a lovely client of ours. We adore the shadow effect created by the font and use of color. It's also really refreshing to see a design that fills the entire card. It's contemporary while also being extremely classy! Congratulations Lauren and Chang! As well as designing our own range of wedding invitations, we also really enjoy working with artists to help print their own designs. A little while ago, we heard from designer, Justin Fines. He had created a beautiful design for invitations for his upcoming wedding and he asked us to print them. We took a look and immediately swooned over his arts and crafts style invitation and RSVP. His designs were just right for the location of his wedding; The Prospect Park Boathouse!